Coleen's Recipes: BEST PANCAKES EVER !!! Nothing fancy here, just tried and true, old fashioned, family style recipes from my kitchen in Alaska. These are absolutely the best home made pancakes we have ever eaten!! They are super tall, light and fluffy and yet they don't get all mushy when syrup is added. 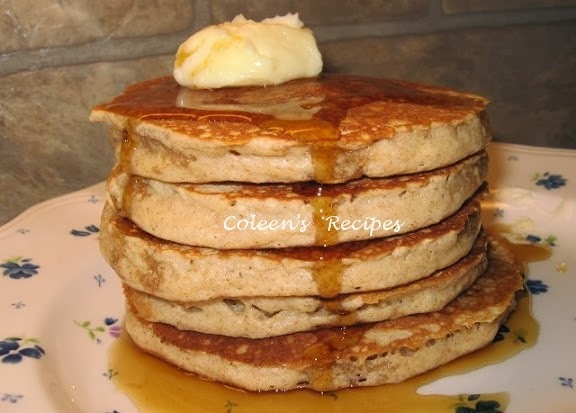 Since I first posted these pancakes, almost 7 years ago, over 900,000 people have visited my web page to get this recipe .... it is just THAT tasty!! Combine the milk and vinegar in a small bowl for 10 minutes to "sour". This is an important step and it is called "soured milk" which is much different that sour milk. I guarantee you will NOT taste the vinegar in the final product. Set aside. Combine the dry ingredients in a bowl. In a smaller bowl, whisk the soured milk, egg, vanilla and melted butter together. Pour into the dry ingredients and whisk until most of the lumps are gone, but DO NOT OVER BEAT!! The batter will be thick, don't add any more liquid. LET THE BATTER SIT UNDISTURBED FOR TEN MINUTES!! After 10 minutes, you will see bubbles in the batter, very important DO NOT STIR AGAIN. GENTLY dip out (don't pour out) 1/2 cup of batter and place it on a buttered grill or frying pan. Cook until bubbles appear on the surface of the pancake and then flip with a spatula and brown the other side. NOTE: This recipe only feeds about 3 or 4 people, but doubles or even triples nicely. NOTE: Don't skip the soured milk part of this recipe, you will not taste the vinegar in the pancakes. The vinegar super-activates the baking soda. NOTE: You can subsitute BUTTERMILK for the milk+vinegar in this recipe, but I have had the best luck (fluffiest pancakes) using the milk and vinegar. NOTE: A few people have written to me and said that their pancakes weren't quite as fluffy or tall as mine. I suspect they are stirring the batter just before cooking the pancakes which deflates the bubbles in the batter. Stirring or pouring the batter essentially deflates the air bubbles in the batter. Personally, I use a half cup measuring cup and GENTLY dip out batter and put it on the griddle and I always get super fluffy pancakes. I sour the milk for banana bread and lots of other recipes. This sounds great Coleen and I will have to try them on the weekend! Wow, those look amazing. They're so huge and fluffy, I think my kids would only need one pancake each! These are the best looking pancakes I've ever seen. I made pancakes with soured milk before and they were amazing. You are right, you won't taste the vinegar at all. Wow, they are so tall and fluffy looking. Thanks for sharing this recipe! I normally always stock buttermilk in my fridge....but once in awhile I forget to grab some while at the grocery store, and my pancakes don't turn out the same when I use milk. I don't know why it never occured to me to substitute it with homemade sour milk! I will definately try these out this weekend! I'm always looking for new and improved pancake recipes. I'm intrigued by the vinegar addition. We are pancake lovers, so thanks for another recipe I can try. My boys are pancake fiends so, I'm always on the look out for new recipes to try. Thanks for sharing! I made these last week & the taste was so yummy. I think either my baking soda or baking powder was old becauset they didn't fluff up as much as I had hoped. :-( I will buy new containers of each & make a new batch. LOVE soft fluffy pancakes! I make a similar pancake but with lemon juice in place of the vinegar to 'curdle' the milk. (FLUFFY LEMON PANCAKES) will definitely give your recipe a go next time round - my two little girls adore our almost weekly ritual of a big pancake cook-up and we're always keen to try new recipes! Have just blogged about them as well (after a very successful post on the Chocolate Banana Bread few days back), I hope youre okay with that, have also provided the referrences etc. Once again, thanks a bunch!!!! Uh Ummmm holy moly...these really are great pancakes...my wife wants them everyday now!I think they taste like pancakes...real pancake taste...very rich..oh I dropped the amount of vanilla by a hair...wow..still love the flavor and texture..
Made these this morning. I had to double the recipe. Huge success. The only problem? I couldn't cook them fast enough for my 3 boys. As soon as I filled their plates they were lined up for more. ;-) I do have a question though. Do you think I could use this same recipe & put it in my waffle iron? To Jennifer: While I've never used this recipe in the waffle maker, I don't see why it wouldn't work. I think I would just add a little more melted butter to the recipe. Can you substitue buttermilk for soured milk? To Anonymous: I don't see why not, although I haven't tried it myself. Do you think this would work with whole wheat flour? Mine didn't come out as tall at all, but they were fluffy and tasted good! very fluffy, tasty, I used part wheat flour for better health! Made these today to rave reviews from the kids. They turned out wonderfully fluffy, and my six year old says, from now on, use this recipe every time! Mine did not look quite like this, but boy were they good. The best tasting pancakes I've ever made! Goodbye Bisquick! Oh My Gosh, I am so full! Just made these and ate about half of them. So Good! They did not turn out as tall as the picture. And next time I make them I will will only use half the sugar and vanilla. But they have a much better flavor than any pancake mix that I have ever used. Thank You for sharing this recipe. Made this morning. They were great! Made these yesterday morning. Took forever for them to cook but WELL worth the wait!! I'll be making them again this weekend! Do you put the milk and vinegar mixture in the fridge or do you leave on the counter for 10 minutes? I have never soured milk before. This might just have to be next weekends breakfast! To Anonymous: Just let it sit on the counter. Can you use rice milk? Thanks gonna give it try we have pancakes for supper During winter,can't wait to cook these. Is there anything you can substitute in for white wine vinegar, like red wine vinegar or regular distilled white vinegar? To anonymous: Yes, you can just use buttermilk instead of milk+vinegar. I wasn't completely sold on the idea of souring the milk. I assumed it was going to give them a taste similar to buttermilk, but thought the vinegar would be overpowering. I tried it anyway and they came out brilliantly! Kids devoured them and the husband was requesting them the next morning. Thanks for sharing this great receipe. Thank you so much for sharing the recipe. I have tried this morning and they are so awesome! I have to x4 of the portion to have enough for the whole family. Thanks again! Great Recipe! This may have to be our new weekend breakfast meal! I just tried this recipe for the first time. My 3 year old son ate 3 pancakes and my 6 year old son ate 4 pancakes! This is after they each already ate a bowl of cereal :) Very yummy! Made these this morning for my 3 kids & they were a huge hit. To make the recipe healthier I always add milled flaxseed and use apple sauce in lieu if butter/oil. Because they were so fluffy, my kids ate fewer pancakes. I doubled the recipe and although after everyone ate (their share was about 10 pancakes), I still have 7 left, which will be tomorrow morning's breakfast. Thanks for the recipe! Ok, I don't care for pancakes, but my family loves them so I made these this morning, they are fabulous!!!!! They were so fluffy and light and the flavor was delicious!!! Thank you fur sharing this recipe and for being so detailed. Can I use sprouted whole wheat flour? Great recipe!!!! I'm a chef and these are the best I've tried! They stand up to a number of add ins as well! Awsome Sauce! I agree best pancakes EVER! This is my 2nd time making them and I've substituted 1 cup almond meal for 1 cup flour and they are just as fluffy andyummy as the original. Is the best pancake I ever made, your recipe is true to the last bite. Love it! Best pancakes I have ever ate!!! Thank you!!! Hmm, do you think this could be made with almond milk? Did exactly as you directed and they were, indeed, the best, fluffiest pancakes ever! Thanks for the recipe! Can I use almond milk? just tried these and they turned out great and huge !! i followed your instructions exactly..
i did add sprinkle chia seed on before flipping them to add some more protein... milk, eggs, chia...has got to be better for me than the crackers i normally find myself grabbing in the morning..
Looks wonderful! If I want to make these for a lactose-intolerant crowd, do you think I can substitute Lactaid milk? Thanks! These are the best pancakes....EVER! Thanks for sharing this recipe! I just made these this morning and they were a huge hit. I followed the recipe exactly and did as instructed. I didn't stir before making them and I didn't pour either. I used a measure cup to divvy them up. These were absolutely delicious. I have never had a pancake raise like that for me and the flavor was just spot on. I tripled the batch with no problem at all. I would definitely share this recipe with others. More than likely it will be my go to recipe now for pancakes. Can you prepare the batter the night before? I made the batter this evening and sealed with saran wrap. I will not stir in the morning and I will dip out the batter. Fingers crossed! Tried these this morning. They were fabulous. My daughter took home the leftovers - there were only 2 left. This is my new pancake recipe. Thank you. I have a similar recipe for waffles. it is out of this world. Soured milk has been used as a substitute for buttermilk in cooking in my family for years. My family loved these big fluffy pancakes!! I will make them again for sure. No better way to enjoy a winter storm in the maritimes! I have been making pancakes for years. But the outcome of your recipe is amazing. HI Coleen, Thank you for this amazing recipe! I have made these pancakes countless times and they are perfect every time! I love how fluffy they are and they don't get mushy when you add syrup. This is my most used Pinterest recipe! Thanks so much for posting! Best pancake recipe I have ever used. I tell people about it all the time. My family now expects nothing else. My son couldn't take his hands off the cooked cakes while waiting for me to finish! This is truly a perfect pancake recipe! Thank you for sharing! The best pancake recipe ever! 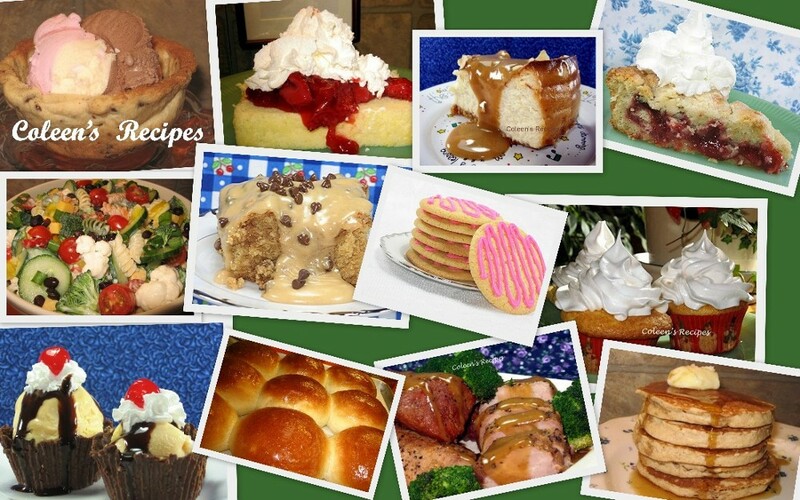 Many recipes I have tried over the years boast of being "extra fluffy", so....I didn't hold out much hope. I was very very pleased to be proven wring! I used sugar replacement and added some almond extract. YUMMMM! This will be my "go to" recipe. Tip; Allow them to cook at a lower than normal heat. It will be worth the wait! Thank you! I made them today and they were delicious. I will use this recipe from now on when I make pancakes. I added chocolate chips while they were still cooking in pan. My son had to force himself to stop eating or he was going to burst! It is a few steps but nothing hard. Definitely worth it! This is our favorite pancake recipe. I do halve the sugar since we drown them in real maple syrup, and double the vanilla since it's so good. Thank you! P.S. I found a sourdough waffle /pancake recipe on king Arthur flour which is pretty much this one and adding some sourdough starter, I plan on trying that this weekend! I made them with almond milk this am and they were divine! Try it! I made them with almond milk this am and they turned out great! These look great. I will totally try. I recommend almond extract in pancakes! But also tried another buttermilk substitute and used 3/4 yoghurt and 1/4 milk cups and added raspberries, this was also delicious! So light and fluffy. The best ever, I will never buy the mixes again. Incredible. The best pancakes ever! I've tried your pancakes:there're fantastic. Realy. The best. Can you make it ahead of time and not use it say for an hr or 2? Wow, these were absolutely fantastic. New family recipe. They were nice and tender and the ingredients were all in the cupboard. I doubled the recipe also. I made these pancakes today and they were "Wonderful" and easy to put together. Thank you for sharing the recipe. My new go to recipe for pancakes. I don't need another. These are the best. Hi from Down Under Coleen! Compliments on a wonderful recipe. I like to use lemon zest instead of vanilla. Amazing! Thanks for the post and thanks for sharing this great recipe. Simply Amazing buttermilk pancake recipe!! Yummy!! Has anyone put chocolate chips in them? Would that throw off the recipe? OMG! I just made these and I'm eating them right now. They came out PERFECT and so big and fluffy! I even threw my whisk in the sink while the batter was resting so I wouldn't accidentally stir it again. LOL DEFINITELY making these again! I put fresh blueberries that had been frozen (extra watery) and they were fine so chocolate should be more thank ok. I have been using this recipe for a few years now. It is simply the best! Fluffy and delish with real maple syrup. Thank you for this recipe. SERIOUSLY, IF YOU ARE LOOKING FOR THE BEST PANCAKES EVER, IT'S TRUE, THEY ARE. MY ONLY REGRET IS THAT I DIDN'T HAVE IT YEARS AGO! THIS WILL BE MY ALWAYS PANCAKE RECIPE THANK YOU COLLEEN! Looks Yummy Will definitely make for my kids.. These are my go to recipe. There are many of pancake recipes out there but I always ended up going back to the trusted box. Not any more it's been almost two years since I bought a box of pancake mix. This recipe is simply the best and will never disappoint anyone that follows it to the T. Thank you Colleen for sharing. Cooking in my Alaskan Kitchen for 40+ years. I love to get recipe comments, however, if your comment includes a LINK (of any kind) it will not be published. Thanks for understanding. All of my recipe cooking times are for a conventional electric oven. If you are using a gas oven or a convection oven, please adjust accordingly. Coleens Recipes Copyright. Watermark theme. Powered by Blogger.